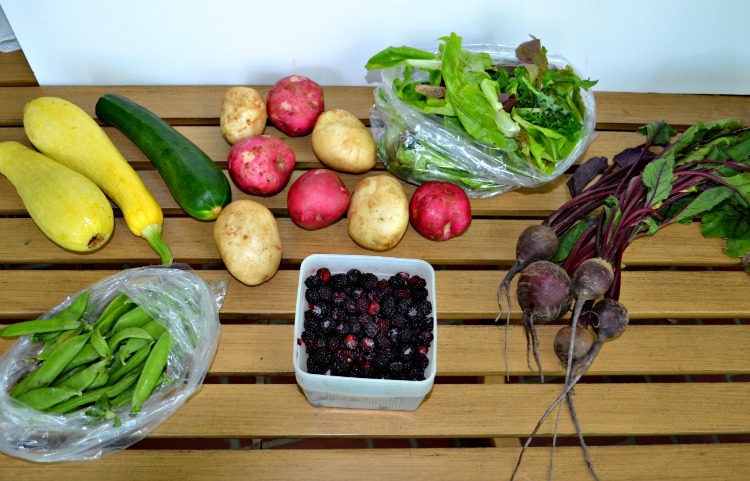 I can hardly wait to tell you about my CSA share for this week. This is by far my favorite share we’ve gotten. 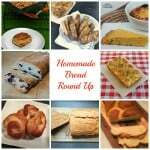 I had ideas for absolutely everything in my bag without even looking at my recipes. This week I received potatoes, a pint of blackberries, zucchini, yellow squash, peas, mixed greens, and fresh cut flowers. As soon as I got home I prepared to make a new recipe for cheesecake in a jar. 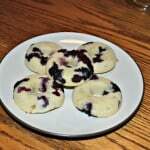 I’ve been dying to make these but now that I had fresh blackberries to put on top I had to make them. To make it even better, I needed to find a recipe using almond flour and this fit the bill. I made the crust with graham crackers, almond flour, and butter which gave it a sweet and nutty taste. Then I made the cheesecake with cream cheese, sour cream, egg, and sugar. Then we topped it off with berries. 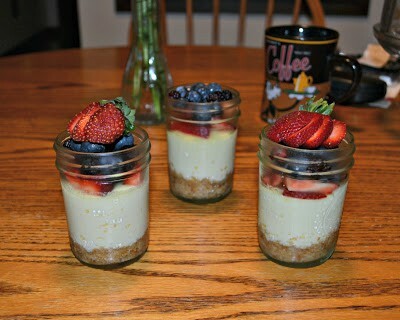 My husband and I actually skipped dinner and just had these delicious little jarred cheesecakes topped with sweet and tart blackberries and other fresh fruit. We paired them with coffee and had an awesome night. 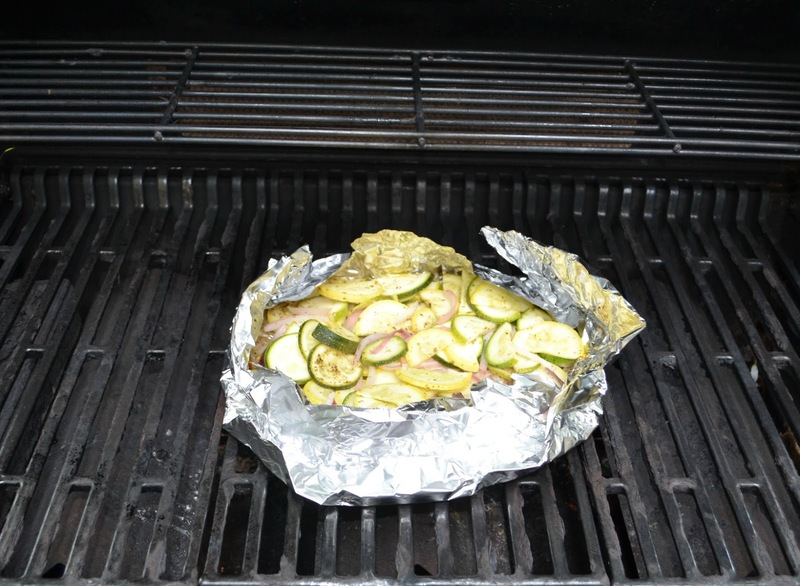 Then the next night I grilled the zucchini, yellow squash, and a red onion I had left over from last week. 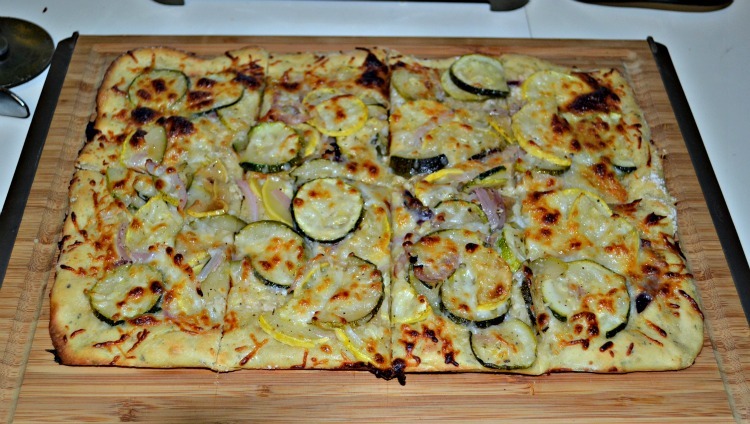 I put it on homemade pizza dough (made with King Arthur’s Gluten Free Flour) and pulled it thin on a baking sheet. I topped it with the grilled veggies and lightly sprinkled it with cheese. It was delicious and we really didn’t miss the sauce on it! 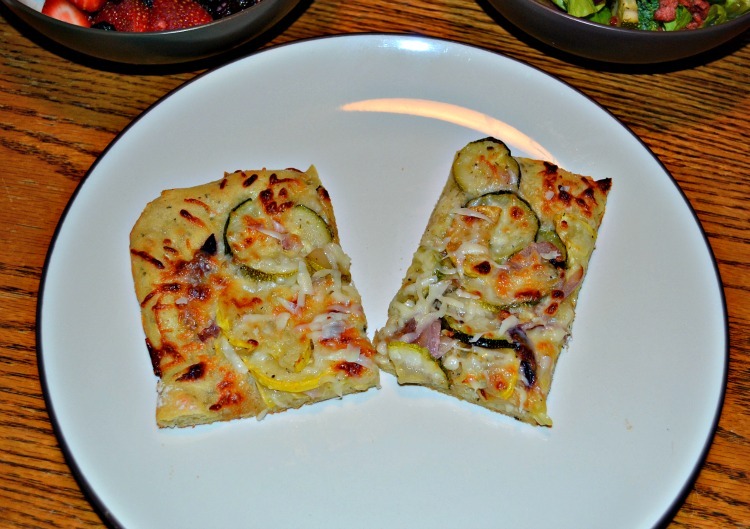 The thin crust got crispy and the grilled veggies had enough flavor to carry the flatbread. 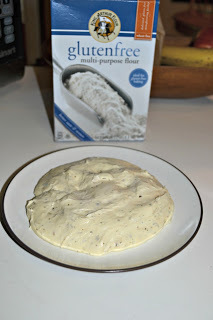 The gluten free flour made for a really nice flatbread. 1. Preheat the oven to 325 degrees. Grease the bottom and sides of four 8-ounce jars. 2. Put the graham crackers in a zip top bag and use a mallet to smash the graham crackers into crumbs. Then in a small bowl melt the butter in the microwave. 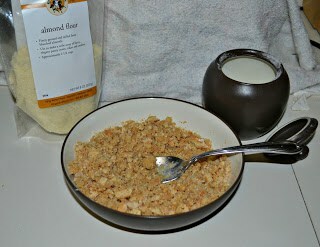 Mix the graham cracker crumbs, almond flour, and sugar with the butter. 3. 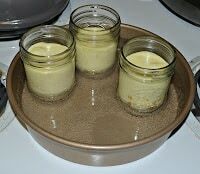 Put several tablespoons of the crust mix into each of the jars. Use the bottom of a wooden spoon to press the crust into the bottom of the jars. 4. In a large bowl beat the cream cheese with a hand mixer. Add the sugar and beat for 1 minutes. Add in the egg, sour cream, and vanilla and beat for an additional minute. 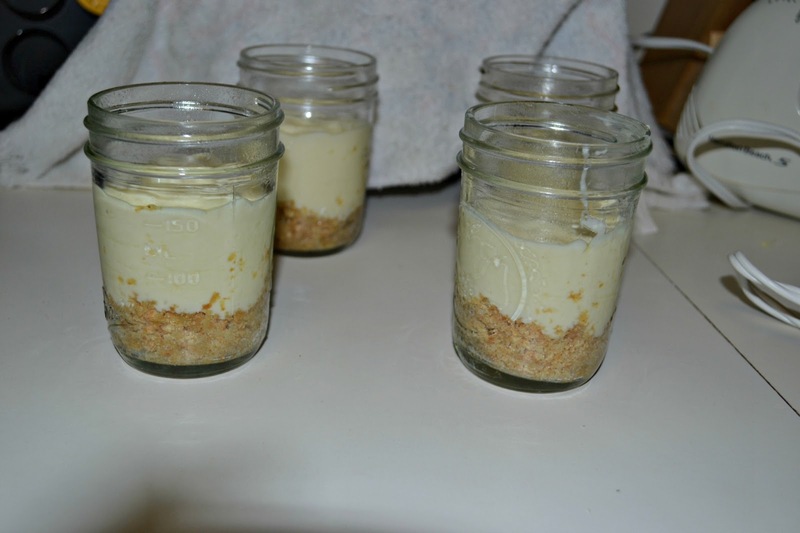 Divide the cheesecake mixture between the four jars. 5. 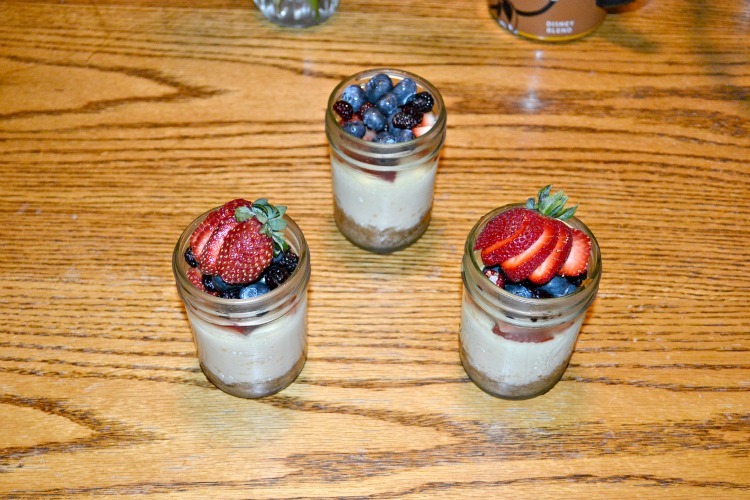 Place the 4 jars in a cake pan. Fill the cake pan 3/4 of the way with water. 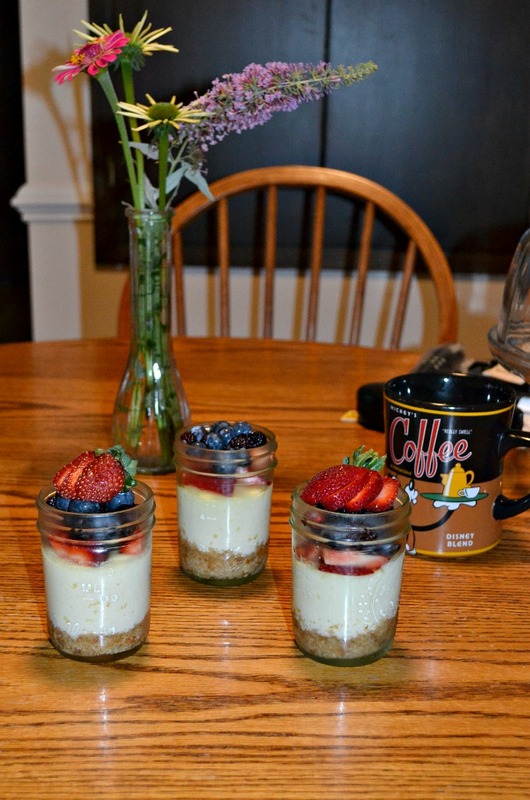 Bake the cheesecakes for 25 minutes. 6. Turn the oven off and allow the cheesecakes to cool for 10 minutes. Remove from the oven and take the jars out of the pan and place on a wire rack for 10 minutes. Move to the refrigerator and chill for at least 1 hour. 7. 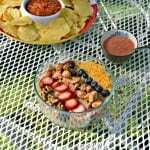 Top with fresh berries and serve with a large spoon. 1. In a small bowl combine the yeast and warm water. Allow to sit for 5 minutes. 2. In a large bowl combine the remaining ingredients. Slowly stir in the water and yeast mixture and mix until just combined. Turn out onto a table dusted with flour and knead for 5-7 minutes. The dough will be soft and slightly sticky. 3. 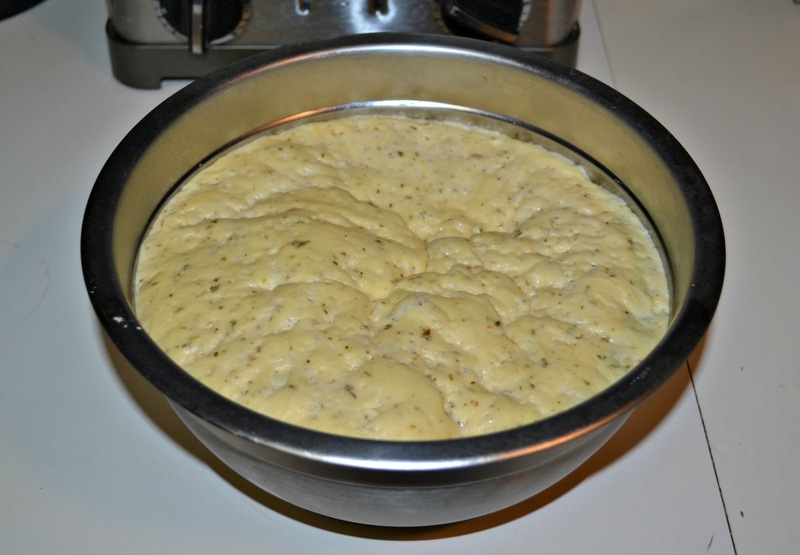 Roll the dough into a ball and place in a large greased bowl. Cover and let rise for 45 minutes. 4. Remove the dough from the bowl. Spray a baking sheet with cooking spray. Wet your hands and gently stretch the dough to fit the pan. Allow the dough to rest in the pan for 30 minutes while you grill the vegetables. 5. Heat a gas grill to medium high heat and preheat the oven to 450 degrees. 6. Place the zucchini, squash, and red onion in a bowl. Toss with half of the olive oil, all of the vinegar, salt, pepper, and oregano. Pour the vegetable mixture onto a piece of foil. 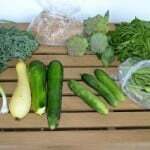 Gather the vegetables into a pouch, leaving an opening in the top. 7. Put the vegetables on the grill and heat for 10-15 minutes or until cooked and beginning to brown. You may need to mix the vegetables in the pouch once during cooking. 8. Meanwhile, brush the remaining olive oil over top of the flatbread dough then spread the minced garlic over top of it. 9. Remove the vegetables from the grill and open the pouch. Evenly place the vegetables over top of the flatbread dough. Sprinkle with mozzarella cheese. 10. Bake for 10-13 minutes or until the crust and cheese have browned. Remove from oven and use a pizza cutter to slice into 8 pieces. That flatbread is going on my menu next week! YUM! This looks delicious and all the family will love it!